Georgia has a project this month that will be useful for you or as a gift for someone! 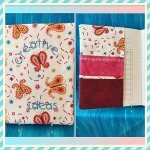 It is a composition book cover that includes organization pockets on the inside cover! This is an appropriate project whether you have embroidery capability or not. Come join us and get better acquainted with the features of your wonderful BERNINA machine!